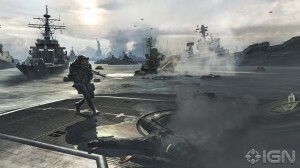 The first person shooter genre is heating up this year, with EA and Activision duking it out with “Battlefield 3” and MW3, respectively. The top brass at both companies have exchanged some heated words, with Activision calling EA “rookies” while EA stresses that Activision kills their own franchises by making too many sequel releases (see Guitar Hero or Tony Hawk). “Battlefield 3” will have a 64 player multiplayer mode and use a brand new graphics engine while MW3 has not changed since MW2. Activision’s hoping that the “if it ain’t broke, don’t fix it” approach will help them come out ahead. Two massively scoped games are being released on the same day: “Skyrim” and “Minecraft.” “Minecraft,” which set the gaming world alight with its massive customizability, will move out of testing and launch as a full product. “Skyrim,” an RPG with a mind bogglingly large open world, promises literally endless months of immersive gameplay. Major 360 games are Halo Anniversary, Gears 3, and Forza 4. Halo is a remake of the game that started first person shooters on the console. Gears 3 is the wrap-up to a trilogy that helped launch the 360, and Forza is another racing game with slightly prettier cars than the last go-around.